Yep. You failed and now you can't resit. I have just given LF a greenie on the grounds that you ultra Lefties have no bloody sense of humour. You just couldn’t resist that, could you? You have been watching horror films haven't you?. That's like the portrait of Dorian Gray.....scary concept. 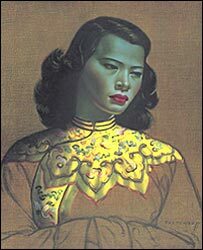 As for that infamous Oriental Green Lady portrait which is reputed to be spooky and have supernatural qualities as the colour is so un natural - I always felt there might be a far simpler explanation - maybe the artist was a tight git who ran out of the correct paint colour and didn't want to buy any more so he decided to make do with left over green paint instead. What if Republicans grew brains, logic and compassion and elected intelligent politicians that actually accomplished something worthwhile for humanity. Lurker wrote: What if Republicans grew brains, logic and compassion and elected intelligent politicians that actually accomplished something worthwhile for humanity. The answer to that is that there would be no need for Democrats. Jules wrote: As for that infamous Oriental Green Lady portrait which is reputed to be spooky and have supernatural qualities as the colour is so un natural - I always felt there might be a far simpler explanation - maybe the artist was a tight git who ran out of the correct paint colour and didn't want to buy any more so he decided to make do with left over green paint instead. I might have posted this before. 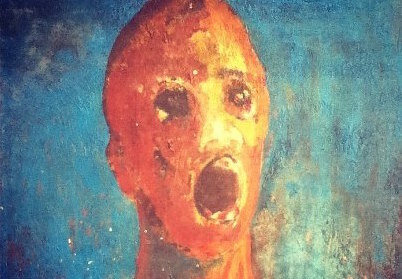 This is called The Anguished Man. It's painted in blood and the damned thing is ghastly to behold. I've seen it up close and personal. Reputedly haunted. All I can say is that we formed a circle round it and the damned thing started to jitter around on the easel! I am racking my brains because in the distant past I have either read or seen a film similar to what you are writing about. It might have been a scary kids story, I cant remember because it's buried in the back of my mind. HoratioTarr wrote: I might have posted this before. This is called The Anguished Man. It's painted in blood and the damned thing is ghastly to behold. I've seen it up close and personal. Reputedly haunted. All I can say is that we formed a circle round it and the damned thing started to jitter around on the easel! Somewhat reminiscent of Edvard Munch's late 19th century painting "The Scream" (or The Cry). The picture got older with the subject, or something like that ! I know that film Nicko, I saw it yonks ago, it's a brilliant film. No the one I meant of a scene with a person (may have been a child) in the frame, every time the owner (or that could have been the child) looked at it something had changed in the picture....it was scary. I have googled but I cant find any clues....I suppose I could have dreamt it. Food poisoning? Oh she's wayyy past the septicaemia stage. In medieval times when the heads of executed dissidents were cut off and stuck on poles, that is the colour they turned eventually. She's basically a cadaver with the eyes propped open - which is yet another thing that people used to do with corpses once the camera was invented. Eww. ps: good luck with your novel, hope it does really well, luv.